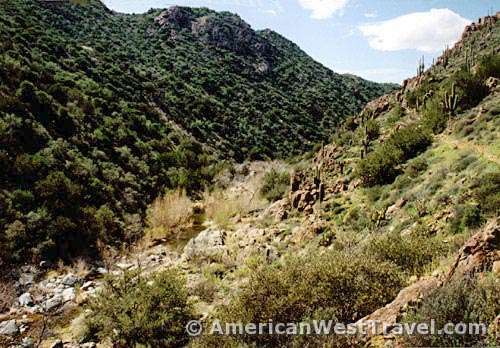 Cave Creek Canyon is an outstanding desert canyon in the foothills north of Phoenix, Arizona. 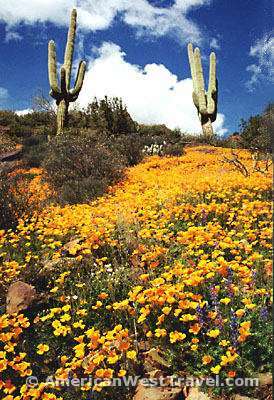 We did much exploring and photography here during the spectacular wildflower season of spring, 2001. 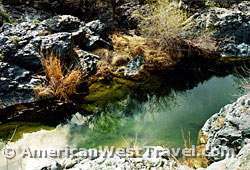 The canyon is something of a rarity due to its perennial stream (flows year round). 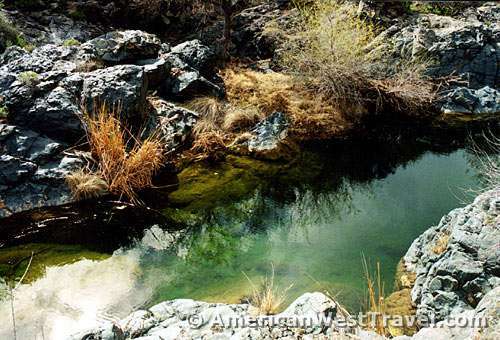 This creates a lush riparian environment within the confines of the streambed completely different from the open desert or even a dry streambed. 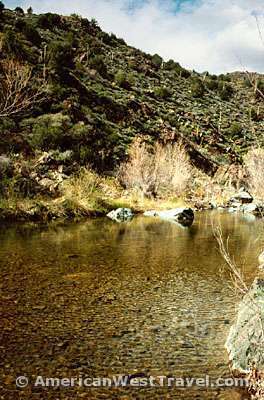 The riparian area includes trees not normally associated with the open desert such as cottonwoods, willow, ash, hackberry. and even giant sycamores. The numerous permanent pools support fish such as minnows and sunfish. Deeper pools support larger fish, some more than six inches in length. One really large pool is a popular swimming hole during the summer for area residents in the know. The steep-walled canyon is unusual in another way as well. 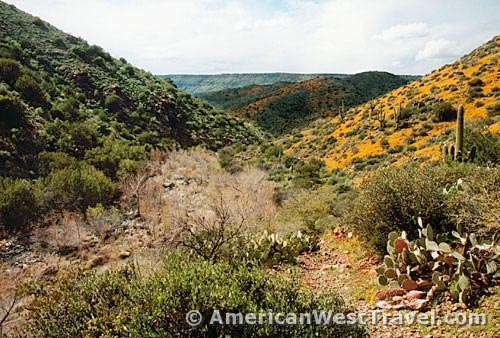 It runs east to west at an elevation of roughly 3,000 feet, where the desert starts to give way to scrub and pinyon/juniper forests. This is known as the Transition Zone. This transition is manifest here quite strangely. 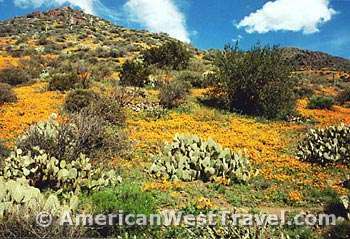 North of the stream, the warmer, south-facing slope is entirely Sonoran Desert, represented by many varieties of cacti and desert shrubs as well as beautiful desert wildflowers (during the season). South of the stream, the cooler, north-facing slope is entirely transitional, represented by scrub oak, small junipers and pinyons with almost no wildflowers. 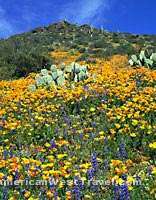 The more open nature of the desert environment is more conducive to large patches of wildflowers. 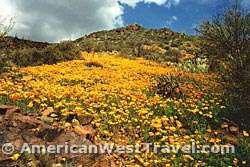 Hence virtually all of our beautiful wildflower photos come from the north slope of the canyon. 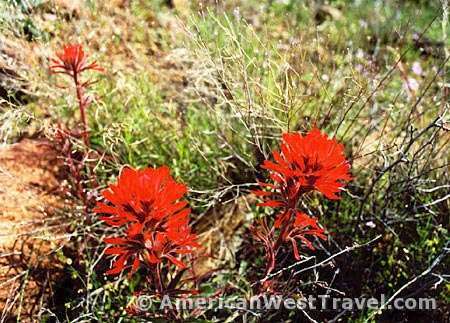 One exception is the beautiful Indian paintbrush (left) which is normally associated with higher non-desert elevations. 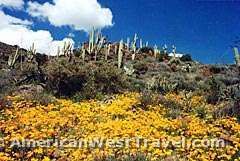 The steep north slope of the canyon, dotted with stately saguaro cacti and photogenic prickley pears as well as huge carpets of poppies during the spring of 2001, offered spectacular photo opportunities. From Carefree, AZ - Take Cave Creek Road/Forest Road (FR) 24 for 20 miles north to Seven Springs. The last nine miles of FR 24 is an all-weather gravel road. The gravel portion of the road is narrow with blind curves and is not recommended for trailers over 16 feet.